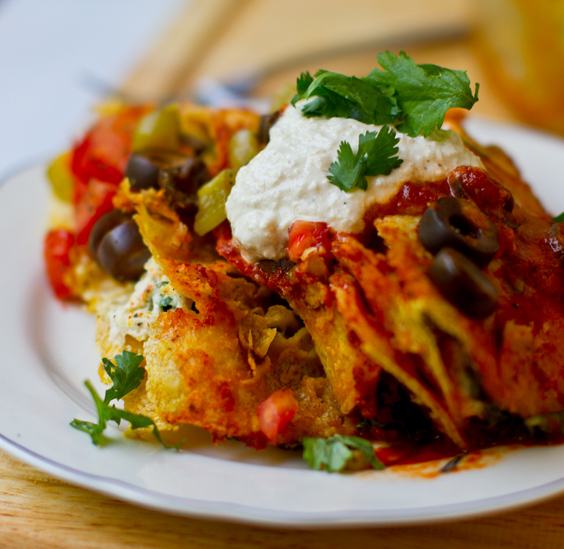 Fact: Enchiladas are usually better the second day. A la leftovers. Yes? But I can attest that these Cashew Cheese + Kale Stuffed Enchiladas Rojas were pretty darn delicious on all three days that I enjoyed them for dinner. 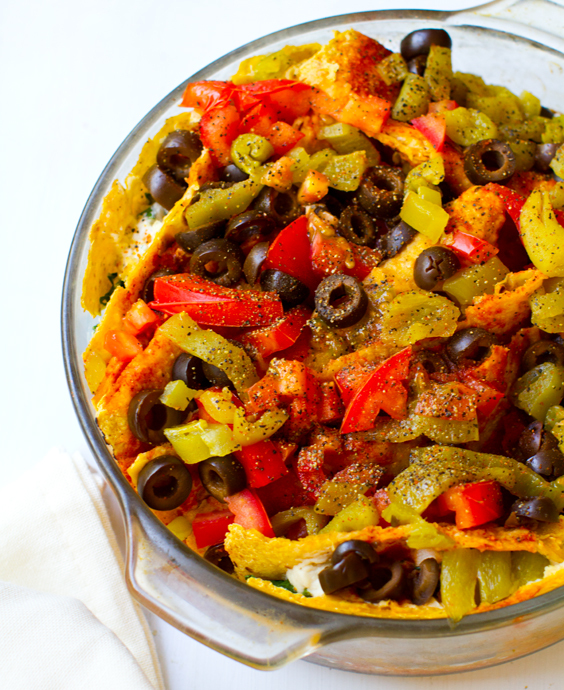 This Mexican-fiesta recipe was a pivot off my Mexi-Chopp Salad. 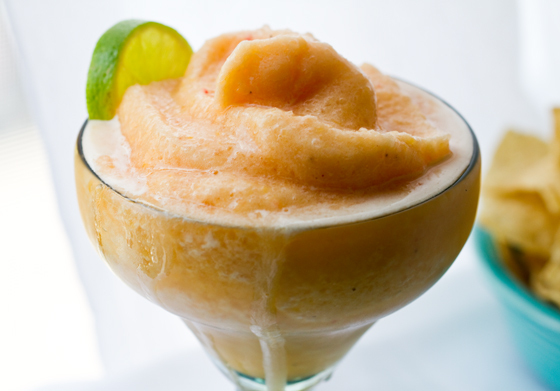 Add a side of homemade party guacamole and a pink Watermelon Frosty and your fiesta dinner is complete. Dive in mis amigos. Recipe ahead + my 6th-wedding-anniv wknd adventures!.. Cashews + kale - minimalist filling..
First day of serving - the leftovers became even more moist + marinated..
6th-Wedding-Anniv-Weekend. Six years ago my life changed f-o-r-e-v-e-r when I stepped into a slinky satin wedding gown and walked down a sand-paved "beachside" aisle in Miami - a candy-colored sunset glowing on the horizon - a small scattered crowd of my closest friends and family looking on. Every day has been a sort of adventure since that moment. Marriage is been a life journey that I am proud to celebrate. Especially since I feel like meeting my husband was such a magical fluke accident that I stumbled into. ..The best things in my life have always seemed to happen so suddenly and out of the blue. To celebrate, last year we went to Vegas. This year we are living it up stay-cation style and enjoying the sunshine as much as possible. We kicked things off with a special spa day at The Peninsula Hotel in Beverly Hills. Completely fantastic. 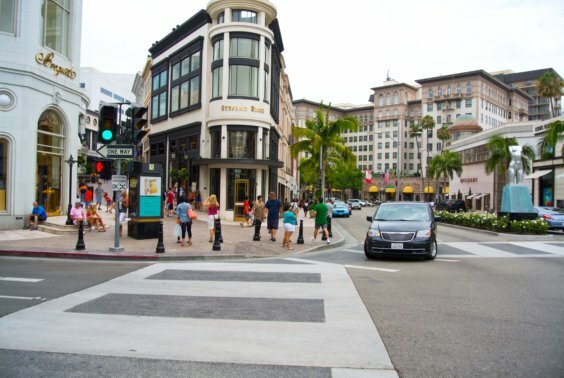 After the spa we enjoyed some fresh summer air by walking the (tourist-crowded) streets of Bev Hills. I popped into M Cafe for a large Beet-Carrot-Ginger-Greens juice. After some strolling we spontaneously decided to venture out to the Los Feliz / Silverlake neighborhood of LA. I rarely go there but was feeling adventurous to try something new. So we had a late lunch at La Flore vegan cafe. La Flore. The cozy, tiny cafe has a very chill feel with rustic wooden tables and water served in shiny stainless steel glasses. The inside was much tinier than I imagined and I was reminded of the Natalie Portman story of when she dined here. I finally understood the fuss - because the inside dining area fits only a handful of small, closely clustered tables. We decided to sit at one of the outdoor sidewalk tables and take in the gritty canyon hills and popping blue sky. Plus the distant view of Griffith Observatory + the Hollywood sign. The neighborhood reminds me of the lower east side meets Brooklyn - back in NYC. Walking the sidewalks you'll find an eclectic mix of hipster-y type people. The scene: cafes, thrift shops, coffee shops cluttered with cool kids hovering over their Mac laptops or iPhones and hillside scattered neighborhoods. I expected a Moo Shoes and Broome street Babycakes to be just around the corner. No such luck. Eats at Flore. 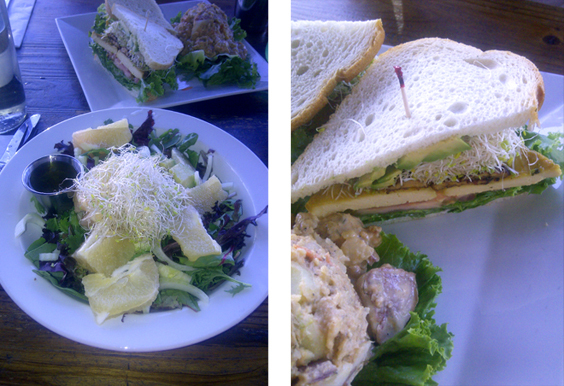 We shared a Fennel Grapefruit Raw Salad and a Club Sandwich - Side of potato salad. All vegan. The sandwich was super flavorful and so was the potato salad - which I'm normally not hugely into. But I found myself taking bites of it with complete delight. Mildly spicy, creamy and yet the potatoes still had a nice firm-enough texture. The tempeh bacon in the sandwich was perfectly seasoned - as was the tofu. And I was thrilled that they used white grapefruit in my salad as opposed to the everyday pink. Citrus + fennel salads are one of my fave items to find on a menu. Sorry about the cell quality, but to give you a peek..
We finished up with soy cappuccinos at Intelligentsia Coffee down the street and headed home to collapse. Lovely Saturday! 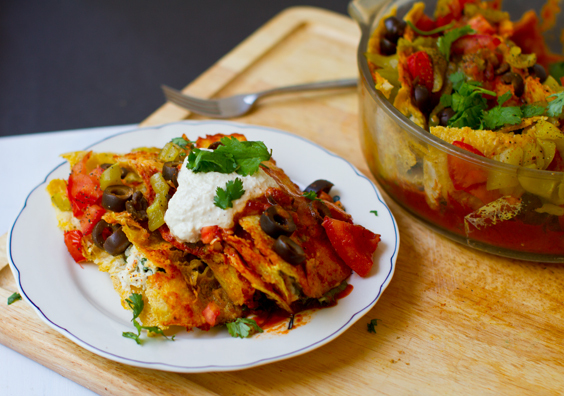 Earlier on last week I made these vegan enchiladas. Usually I get bored with leftovers by night three. But I thoroughly enjoyed all three nights of these blissful rojo bites. 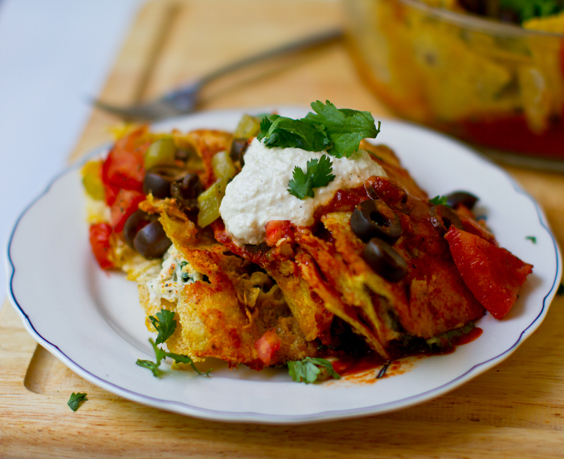 As stated above - enchiladas really do get better the next day as leftovers. 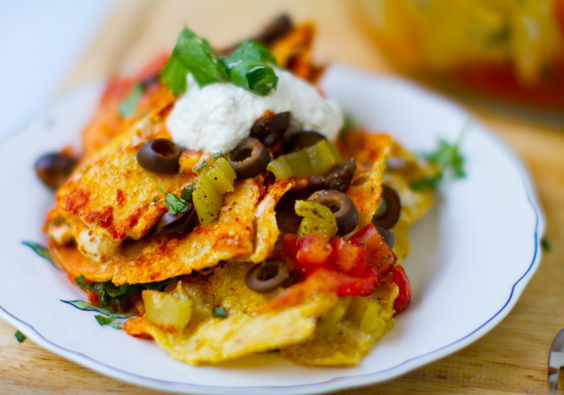 The flavors infuse into the tortillas and everything becomes marinated with deliciousness. Light on sauce - I let those chilies and tomatoes and olives moisten things up..
**If you want to make your own enchilada sauce - I really like this Bonzai Aphrodite recipe. 1. 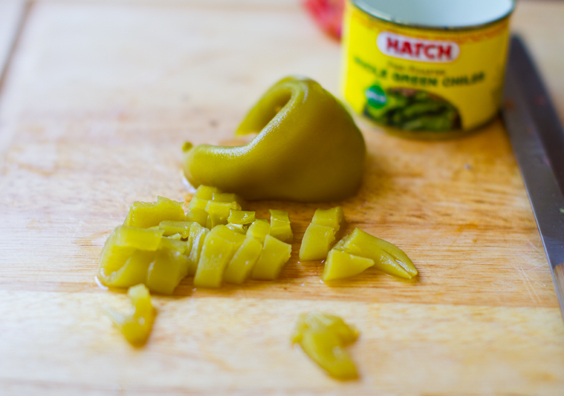 Give yourself at lest 6 hours to soak your cashews before starting this recipe. Soak them in salted water - until tender. 2. 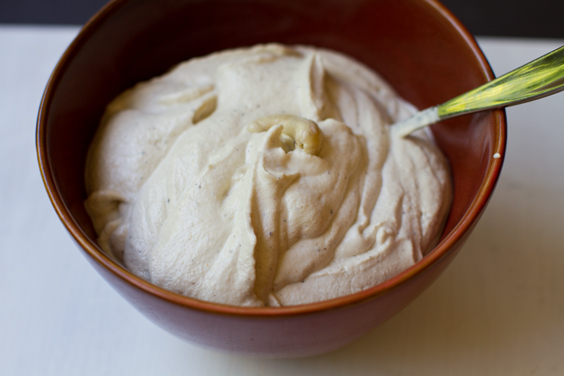 Cashew Cheese: Drain your soaked cashews and rinse them in water. 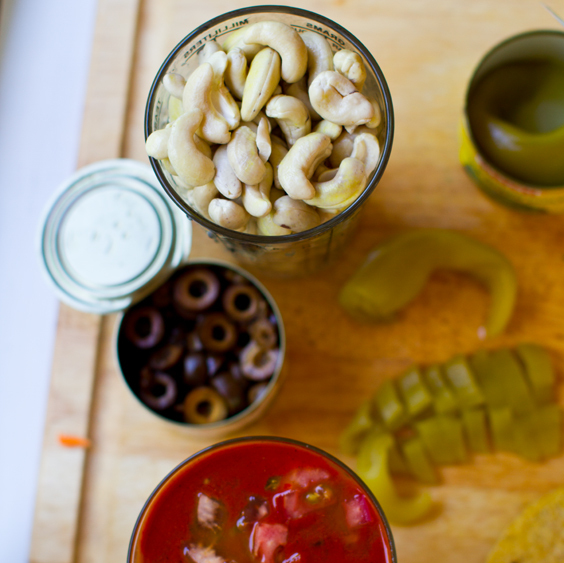 Add the drained/rinsed cashews to a Vitamix or food processor. Add the cider vinegar, a pinch of salt and pepper (optional chipotle powder) and a splash of water. Start the blender on low. Add in more splashes of water until the mixture is churning well. Allow to mix until smooth. 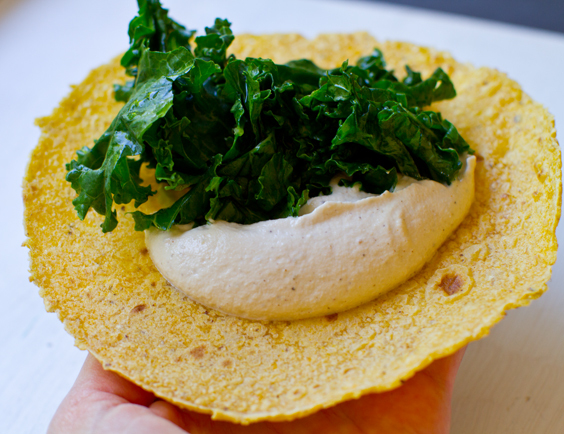 Add in only as much water as you need to achieve a smooth hummus-style consistency. Taste test. Add in a pinch more salt and pepper if desired. Place in fridge to chill. 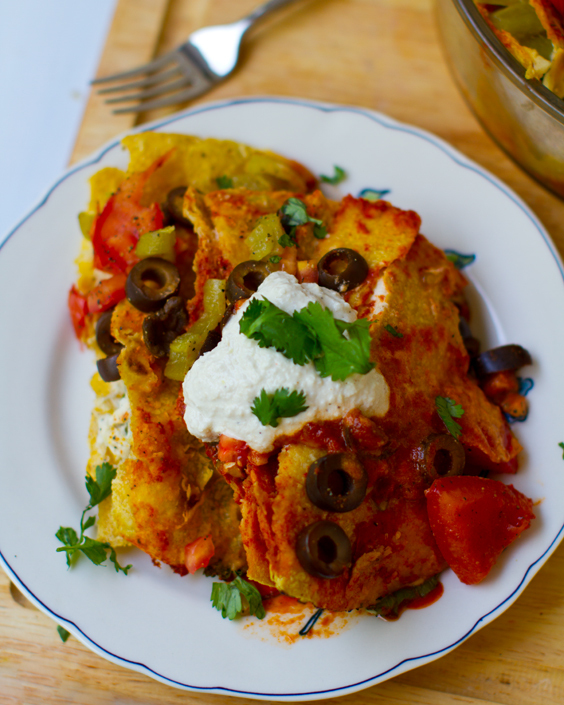 Note: you will only use part of the cashew cheese to fill the enchiladas - the leftovers can be added chilled over top the hot enchiladas when you serve them. (Like a dairy-free sour cream). 3. Kale: Prep your kale by pulling leaves from the thick stems. Rinse the kale very well and plunge into very hot - almost boiling water. Quickly remove plunged kale (I use a straining basket) and submerge the kale into ice cold water. I simply fill a very large bowl with cold water and ice and submerge the strainer that contains the kale. Pull the kale and either spin or pat dry. Set aside. 4. Preheat oven to 375 degrees and start assembling your enchiladas: Add a generous scoop of cashew cheese + kale to each tortilla and roughly roll or fold and line up in your baking dish. I find that slightly warming the tortillas before filling makes then more pliable. 5. 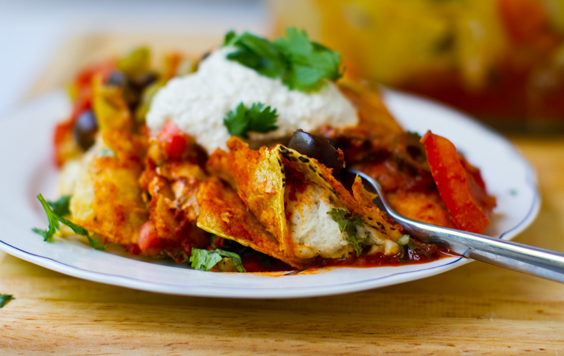 With your baking dish stuffed with tortillas you now can pour your red enchilada sauce right over top. The amount is variable - more sauce means moister enchiladas. Then I take all those chilies + olives + chopped tomato and cover the top as well. I used a very minimal amount of red sauce - you can use more if you'd like. I also omitted vegan cheese - but you can add some over top if you'd like. Lastly, I added some pepper and chipotle powder over top and done! 6. Bake at 375 for about 45 minutes - covered. Allow to cool about ten minutes before serving. Or even better - serve the next day! 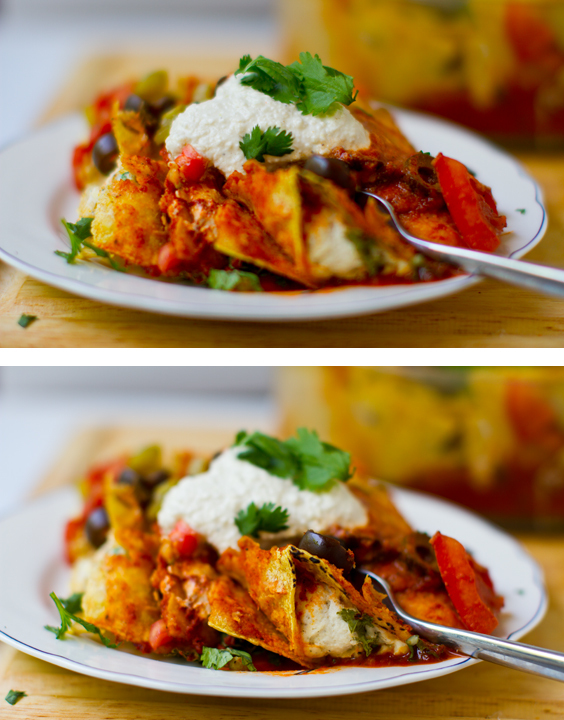 Yes these enchiladas are delish re-heated in the oven. Serve: with an added dollop of chilled cashew cheese + chopped cilantro over top. Yay lots of freshly chopped cilantro.